SUMMARY: CORE PUNCH is set in a future New Orleans, or rather NON (New Orleans New) in which the city has been lifted and is now a floating city thanks to alien technology. Violet Baker, called Vi, is a detective with the NONPD. She’s a cop to the core, from a family of law enforcement, and a history in New Orleans that goes back long before it was a floating city. She is tough, good at her job, and committed to it. She gets paired up with a handsome purple alien as part of the exchange program with the alien Garradians. He is Dzholh Ban!drn(yes, it’s stylized that way), called “Joe” because its too difficult for her to pronounce his name. Joe is by the book; Vi is more free-wheeling. It’s the cop/buddy theme with aliens and a budding romance. They are sent on a mission to NOO (New Orleans Old) while a severe storms threatens. They find themselves stranded, in the middle of a murder mystery, and facing a storm that they may not survive. 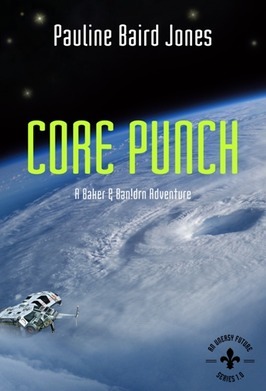 REVIEW: CORE PUNCH is a combination of mystery and science fiction.The focus of the story is on the adventure-facing the storm, finding the source of the sabotage of their skimmer. I enjoyed the partnership between Joe and Vi. Pauline Baird Jones does a great job with dialogue. I particularly liked Joe’s POV. He is an alien with an alien’s view of earth and puzzlement over human behavior. Raised among Garradians who appear to strive for perfection and uniformity, he is attracted to Vi’s flaws-which make her unique. The story was a bit tech heavy for a fairly short novel. Joe has a nanite/AI personality type of thing implanted in him that provides information and insight. This means that you get two POV’s- confusing until I got used to it. There is also fairly detailed talk about how the skimmers work, what is done about the approaching storm, etc. It’s nifty tech; I liked it and found it interesting; but it did slow up the romantic storyline a bit. I often felt as if this was material for a full novel and more space would have allowed more time to reveal information about Vi and Joe and give a more complete picture of the world. I’m hankering to know more about Joe’s homeward and the Garradian culture. On the whole, I think it was solid story. Four stars as an SF story, 3.5 as a romance. Copy provided by the author in exchange for an honest review.